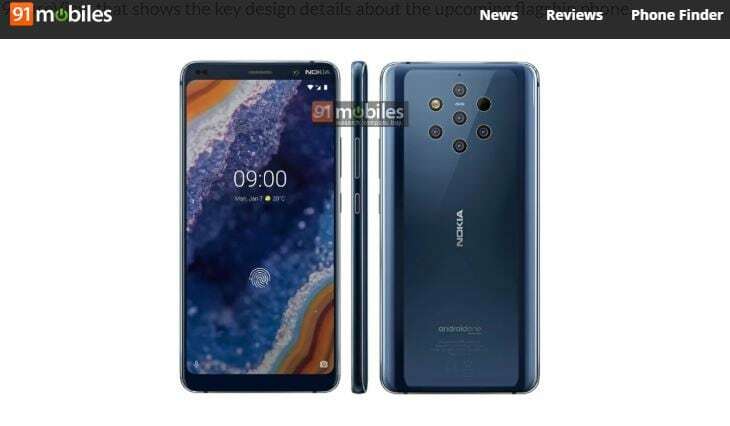 The Nokia 9 PureView has been a part of the rumour mill for nearly half a year now and recently HMD Global, who own the Nokia brand, had announced a release date of 24 February at MWC 2019. Now a lot of renders have popped online which showcase the design of the smartphone, yet another leaked render has highlighted a new feature that was previously unknown. As per the render by 91Mobiles and OnLeaks, we can see that the five-camera setup along with a sensor and flash on the back is going to be as we had expected. However, on the front, we see that the phone has an in-display fingerprint sensor, which would make this the first Nokia phone to have one. Another thing to notice on the front of the phone is that there are thick bezels on the top and bottom, which means that Nokia is not jumping onto the notch-express for its premium phone. In terms of selfies, we see that the render has only one camera and a couple of sensors. While the report claims that these are official renders of the phone, and they look official enough, these are still leaks and neither Nokia nor HMD has said anything about them. The Nokia 9 PureView is expected to come with a 6-inch AMOLED QHD+ display and include an in-display fingerprint sensor. Apparently, the phone will accommodate Qualcomm’s year-old Snapdragon 845 chipset instead of the new Snapdragon 855 mobile platform. However, reports also suggest that Nokia is planning to announce a 5G-compatible variant of the same model in the future.